Image quality and ease of use of intraoral camera have improved tremendously over the years. 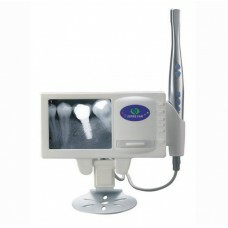 Most are now very slim and ergonomically designed dental handpieces with a single button for capturing images quickly, while others may require the click on a computer screen’s icon to capture the desired images. Most are corded and can plug into the USB port in the computer. As with many dental products, multiple manufacturers of intraoral cameras are able to bridge with different radiography software. Similar to computer programs and products, each intraoral camera system has its own features, and some are compatible to specific software. Most dealer reps will offer a demonstration of the various camera types that are compatible to an office’s software systems. Many individuals want to do only treatment that dental insurance will help pay for. One great way to aid in the preauthorization process is to provide an intraoral image to the insurance carrier. An example is when a patient has a tooth that needs a crown due to fracture lines and a large filling. The radiograph does not show a fracture, and may or may not show the decay depending on the surface of the tooth. The patient may state nothing hurts and want to know if insurance will pay a portion of the proposed treatment before they decide to proceed. Take an intraoral image and show the patient the fractures. A good intraoral image will show the fracture lines in clear detail. Submitting the intraoral image along with the preauthorization or insurance claim may help the approval process of needed treatments such as crowns and even periodontal therapy. The saying “A picture is worth a thousand words” is so true. In dentistry, it couldn’t be more accurate in regard to the use of intraoral cameras. Using images to explain needed treatment helps patients visualize oral conditions as well as the possibilities to improve their smiles. Intraoral imaging is not only used to identify fractured teeth or periodontal conditions, it can also be used for areas of cosmetic improvement. Intraoral images are necessary prior to orthodontic treatment as part of the records process in conjunction with impressions. Images can also be used to show the shade of the teeth pre- and post- whitening treatment. It can often be used to send images to the lab when cosmetic restorations are done to match shades or shape of the teeth.